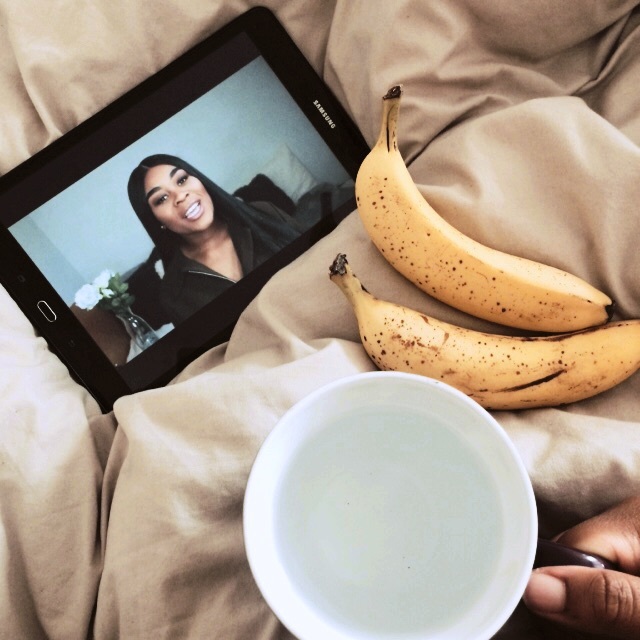 Watching NissyTee whilst enjoying some bananas and hot water. Am I the only person who drinks hot water? Rewind back to 12:00pm today and I’m warming up my rice, thinking about my neglected blog. Well my blog hasn’t really been neglected, but I feel very guilty. There’s only one lonely post up for this month. I no longer have a schedule for my posts, however I like to have a few good posts up each month. Not having a schedule for my blog equals less stress, which is kind of funny because I have been driving myself crazy for days trying to figure out what to write about. An idea would come to mind, but I would end up talking myself out of it. So whilst warming up my left overs, I decided to write a blog post about me not being able to write up any blog posts *yay. I have been thinking about writing about my lack of interest in men latelt. I’m not “coming out”, I’m just speaking about my lack of interest in men at the moment. I have thought about writing some posts that are pro-black men, because I think I have been kinda harsh on my blog and on social media when it comes to black men. Contemplated adding my two pence to the conversations about Kendrick Lamar’s new Humble video. But I feel like Latasha & Jeffery have already said what needed to be heard. I kind of want to speak about how I feel about the lack of people willing to listen to black women and black women being removed from important parts of history, and the damage that it causes. Even though it kind of speaks for itself I want to sprinkle some of my thoughts on the topics. The disconnect within the black community is something that really interests me. I want to know what needs to be done to build a better sense of community, whats the first step? Its all really fascinating, it’s something I want to be a part of. I briefly wanted to speak about intimacy, but that was one of the topics that I kept talking myself out of doing. I was just questioning if intimacy, specifically non-sexual intimacy would be classed as self care. It sounds weird but there are times when it would of been nice to have someone to chill with in silence or someone to vibe to music with. That’s something that I normally do by myself and I enjoy that time, however I also feel like I need company sometime. Just not the kind of company that is going to drain me. Those are just some ideas. I still need to get some more books to read for book reviews. I’m excited to get some book reviews done and expect some hair related posts soon. I am now working with the Shea Butter Cottage, a UK black owned business that sends a percentage back to the communities the ingredients are sourced from. I hope you all have a lovely Easter. Let me know what you think about my blog post ideas. Is there anything you want me to write about?